Herbivorous animals are those that eat plants. Many plants have evolved mechanisms for preventing herbivory. Some have thorns, glandular hairs, odors, and an array of mechanisms. Some have taken on fungal partners that will grow within (fungal endophytes) and without causing damage. The fungus in turn will make varmints sick because of the metabolites they secrete. On the one hand, fungal endophytes are beneficial because they protect the plant; while on the other hand, they are detrimental because they cause problems for us and our domesticated animals when we eat such plants. In this chapter we will look at the beneficial ones, the ones that prevent herbivory, and in a later chapter we will focus on the detrimental ones that cause ergotism in man and animals. 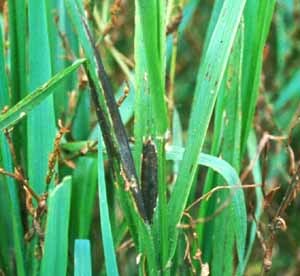 Many grasses are infected with systemic fungi belonging to the Clavicipitales. A common endophyte on grasses is Epichloe, or what we commonly call the choke disease (Fig. 12-1). Fig. 12-1. 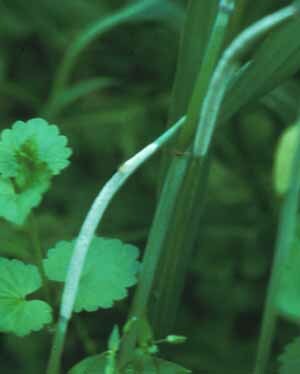 Epichloe typhina infecting a grass stem. It does not cause disease at all, but instead is useful in enhancing growth of the grass. Balansia (Fig. 12-2) differs from Epichloe in having a flattened stromatic growth, and Atkinsonella that gets into the seed heads and also forms large pustules on the stems (Fig. 12-3). Fig. 12-2. Grass blades infected with Balansia clavula. Fig. 12-3. Atkinsonella hypoxylon on a grass stem. It is within these black stroma where the perithecia, i.e. sexual stage, develops. Some have an Acremonium conidial state. This group of fungi will be discussed later in their roles as the cause of plant diseases and ergotism in man and other animals. Infection makes grasses toxic to mammals and increases resistance to insect herbivory and grain consumption. Some grasses are sterilized by endophyte infection while remaining vegetatively vigorous; other infected grasses remain completely fertile. Experiments demonstrate that plant growth and seed production can be increased by infection (Clay, 1988. Ecology 69:10-16). Thin sections of infected grasses, when stained with a fungal stain, reveals how the fungus ramifies through the tissues (Fig. 12-4) and can be grown in culture when the proper medium is used. Fig. 12-4. Endophytic mycelium within the tissue of a grass blade. 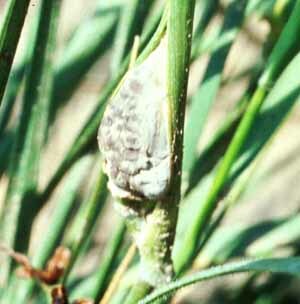 The greatest detriment of these fungi is in causing abortion in cattle that graze on infected grasses. Abortion levels are directly proportional to the levels of endophyte infections. Animals may also develop diarrhea and become lethargic. 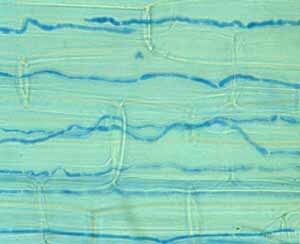 Endophytes can also influence seed germination. In order to repel insects that damage grasses, farmers may purchase endophyte preparations to inoculate rye plants before planting. Carroll (1988. Ecology 69:10-16) has demonstrated that fungal endophytes are found consistently in the leaves of conifers and a few woody broadleaf trees. These endophytes, like those on grasses, are suspected of preventing herbivory by insects and small mammals. Species of Cryptocline, Rhabdocline, Phaeocryptopus, Phyllosticta, and Nodulosporium are commonly found on Douglas Fir in the Pacific Northwest.